A week after the Chelsea Preservation and Planning Committee voted unanimously in support of Jamestown Properties’ 300,000-square-foot expansion of Chelsea Market, the full Community Board 4 followed suit. At a meeting last night, the board voted 24 to 14 in favor of the expansion, with their support being conditional on Jamestown’s commitment to provide 90,000 square feet of affordable housing within the new building (the board also outlined several other conditions last week). In addition to the impact the expansion will have on the neighborhood, the physical design of the expansion has been a major point of contention, and it has changed drastically since the first iteration in 2010. The Architects Newspaper runs through the ways in which the design has morphed. 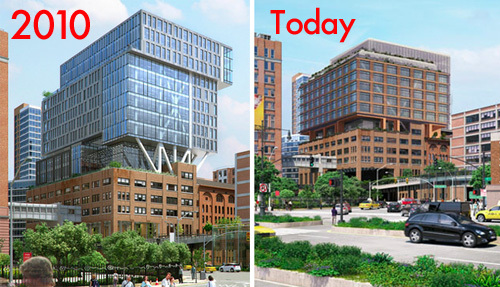 The original design by Studios Architecture had a cantilevered form that “jutted out over the old structure, with a large void separating the old market from the new addition on top,” writes AN. “The exposed trussed structure formed a box that sat within a brise-soleil clad box facing the east.” This trussed structure still remains, but the community wanted the glassy box to be more contextualized within the neighborhood and surrounding buildings, so a terracotta cladding was added. The gap between the old and new structure also remains, but less obviously, as it will be enclosed in glass and brick “thus hiding engineering that allows the addition to metaphorically float free from the past.” Along Ninth Avenue, the expansion’s height has been reduced to match those of the nearby buildings. A board member of the group Save Chelsea, which opposes the expansion, said, “No amount of design massaging will change what a zoning atrocity this is.” For an explanation to that claim, read more here. Now that CB4 has voted, the proposal goes to the Borough President’s office, where Scott Stringer has 30 days to make a decision. Then it goes to the City Planning Commission, and finally to City Council, which will have the final say in October.